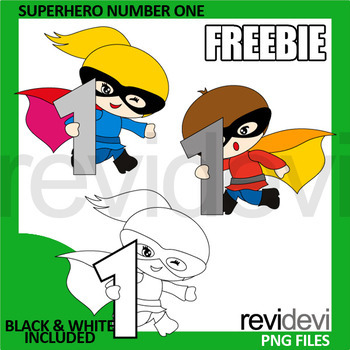 Superhero number one free clipart for commercial use. This is a fun clip art in bright colors. This set features boy and girl with number 1. Great for cover page, chapter title, activities sheets for pre-K and elementary kids. Black and white version is also included. YOUR RATING and COMMENT is highly appreciated. If you like this set, please SHARE this post, or PIN on your boards. The collection is suitable for school and classroom projects such as for bulletin board, learning printable, study worksheet, classroom decor, craft materials, activities and games, and for more educational and fun projects. - Each clipart saved separately in PNG format, 300 dpi with transparent background. Commercial license and non-profit/personal license included. Please give credit to REVIDEVI and link back to my TpT store.